Anton Vinokurov seems unstoppable. Vinokurov raised to 180,000 with :::9d:::7d from middle position. 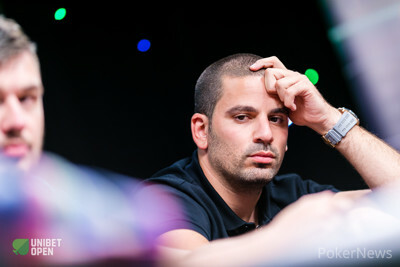 His left hand neighbor, Amir Shomron, called the bet holding :::Kh:::Qh and they went heads-up to the flop. The flop came down :::5h:::3c:::6s and both players checked. The turn was the :::8h and Vinokurov hit a straight, while Shomron had two over cards and a flush draw. Vinokurov bet 150,000 and Shomron raised to 315,000. Vinokurov moved all in, covering Shomron by a mile. Shomron called the all in and was at risk. The river was the :::Ac and Shomron was eliminated from the tournament in 8th place.